Summer is fast approaching South Africa, and we all know what that means: lighter clothing, picnics and barbeques with friends, and lazy summer afternoons lounging around some country retreat. Don’t have a country retreat of your own? Well we have many here on homify, so allow us to inspire you with one of them. Our choice for today takes on the shape of a stunning little summerhouse with exceptional design that can also be used throughout the year thanks to its thermal insulation. Occupying a mere 60 m², it is situated at the foot of a lush forest and overlooks a tranquil lake. So of course fishing and enjoying sundowners by the water’s edge are thrown into the mix! 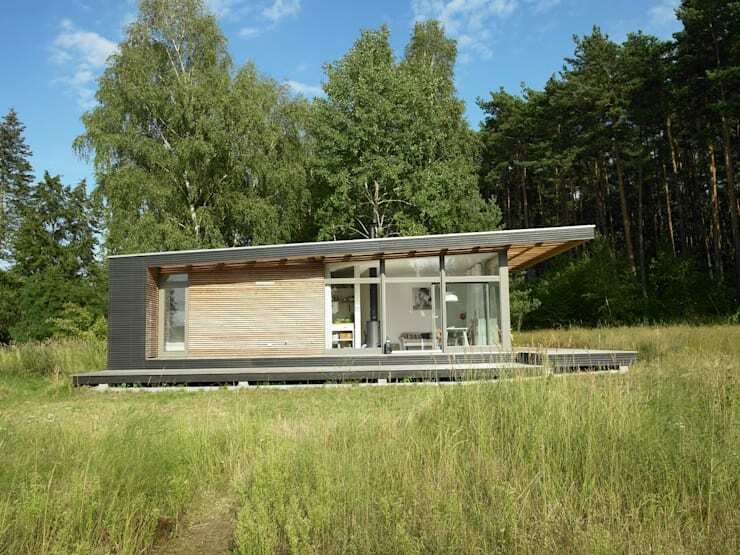 This little prefabricated home with its Scandinavian style is the brainchild of German-based architectural firm SOMMERHAUS PIU. Let’s see what they are capable of! Characterised by clean and simple lines, as well as open spaces, the house is a definitive contrast with the lush forest behind it. Thin horizontal timber strips make up the façade, while the slightly sloping roof is edged with charcoal planks. 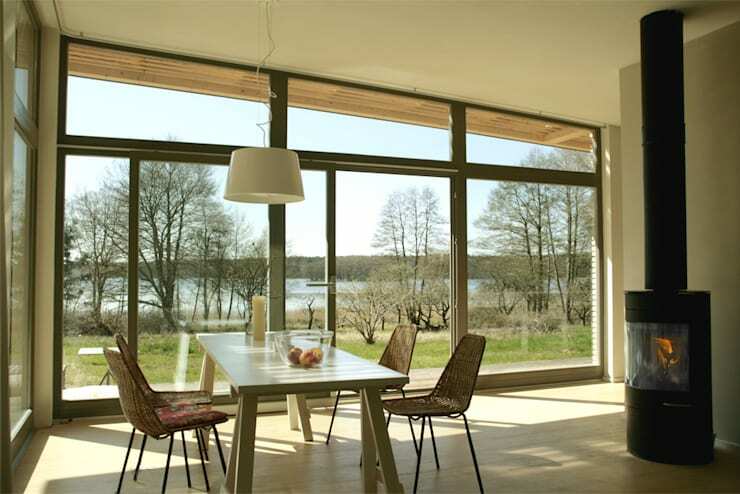 And those generous windows do so much more than ensure a pretty view: they are energy efficient alterations that help to keep the interior spaces cool – perfect for a hot summer then! We’re only on our second image, and yet we are already planning on when to pack and set off to this glorious setting. Just note this fabulous dining space that happens to overlook the gorgeous lake nearby, thanks to the floor-to-ceiling windows. A simple log-burner oven ensures that this dwelling is perfect for a winter retreat too, neatly warming up those rooms until they’re as toasty as desired. The heart of the home (a.k.a. 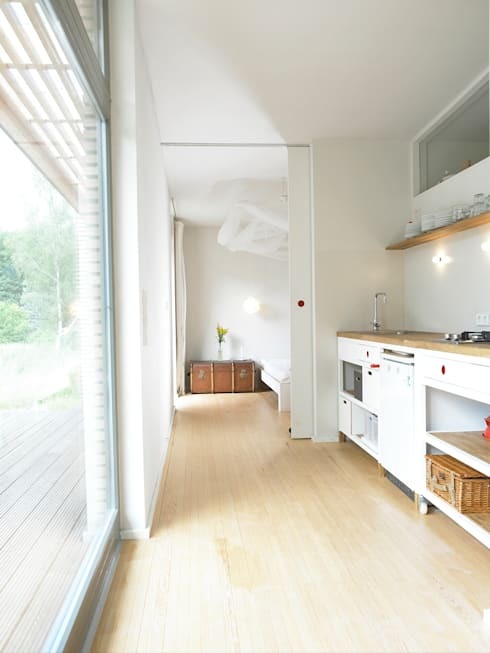 the kitchen) is moderately sized, simply because nobody plans on cooking up a storm while enjoying a getaway in the forest. Here we see how bright and cheery the culinary space has been made, thanks to the large windows (again) and the crisp white cabinetry. A discreet sliding door separates the kitchen from the bedroom, which is done up sparsely yet charmingly. Adorned with the same white colour scheme as the kitchen, the bedroom flaunts select pieces that add some warmth and character, like the vintage chest seen here in the far-away corner. And FIY: the bedroom, unlike the rest of the house, has limited windows. You know what that means: sleeping in as late as you want without having sunlight come wake you up! Now when dusk starts approaching and we are opening that second bottle of wine (who’s counting, right? ), where do we retreat to? How about this charming deck overlooking the lake, which can also double up as an exterior dining spot? 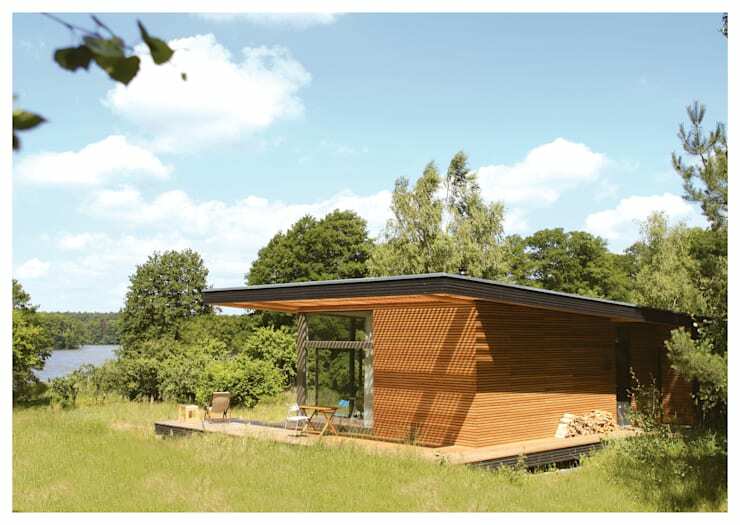 Our designers have also included a covered veranda which wraps the entire perimeter of this little summer house. This addition also ensures that the house is protected from the elements, which could erode the quality of the wood. Before bidding ‘farewell’ to this little gem, we need to take a look at what the lake view looks like seen from the house. Standing here behind the house, we can see how the architects have constructed the house on a slightly raised platform so that the timber doesn't come in contact with the soil. Clever, sophisticated, and most envy-inducing? Our thoughts exactly! If you want to enjoy some more homes with fabulous views, might we suggest: An Eastern Cape Home with Champagne Views? What do you think about this little forest house? Perfection, or not your style?